He was 25. She was just 20. Private Martin John Suter and Florence (Flo) Reid were young and in love…but a war and an ocean separated them. Be that as it may, hundreds of postcards helped them keep the flame alive. Embroidery and kisses tell the tale of a couple, of an era and of a florid and flourishing industry. A constant flow of letters and cards crossed the Atlantic throughout. A few scrawled words – often dashed out by illiterate soldiers – were usually the only contact the troops had with friends and family. They spoke of everything imaginable…but mostly of their longing for home and of the love that tugged at their heartstrings. The postcards, usually adorned with a simple drawing or black-and-white photo, cost a mere penny. They were scribbled upon by the dozen, to be later gathered up in an envelope and dispatched to Canada. 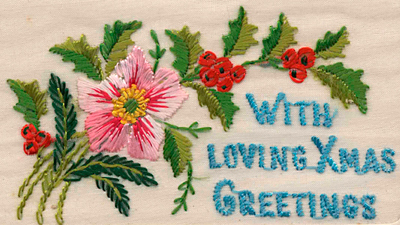 But grand declarations of love and holiday wishes deserved better: postcards decorated with a motif in hand-embroidered silk, sometimes fashioned into a pocket that could contain a photo or love note. Especially popular with soldiers posted in France and Belgium, these delicate little treasures could cost a whole day’s pay. Just the same, love-struck soldier Martin Suter would send hundreds of them to his beloved. And they contained symbols that were suited to the moment: holly and mistletoe for Christmas and New Year’s, red roses of love, violets symbolizing remembrance and fidelity…and let us not forget the forget-me-nots! The Canadian War Museum holds an impressive number of these magnificent embroidered cards, but the Suter collection distinguishes itself by its richness and by its unusual story. In 1967, a cardboard box was discovered along highway 401. It contained dozens of silk embroidered postcards dating from the First World War. The backs were inscribed with tender declarations of love written in uncertainly-spelled English, always ending in a plethora of Xs marking the spot of his long-distance kisses. Relics of a pure, almost naïve love fighting against the tyranny of absence. A few years later, the postcards made their way to the Museum, where the Military History Research Centre undertook the task of solving the mystery of their origin. Who were Mart and Flo? A long search finally led to Private Martin Suter and his beloved Florence. As we follow the course of their history, we discover that the silken cards finally won the day. After the war ended, Martin and Florence were married on April 30, 1919 in Galt, Ontario. Their love story would endure right up until Martin’s death in 1955. Florence passed away in 1967 and it is while her personal effects were in transit that this treasure trove of memories ended alongside the highway. Three generations of the Suter family have visited the Museum to relive, through silken stitches and scribbled words, the love from which they were born. These cards are periodically presented in exhibitions at the Canadian War Museum and Canadian Postal Museum but you are also welcome to view them by appointment and unravel the threads of the beautiful and touching love story they weave. To find out more about the postcard collections in the Military History Research Centre or to make an appointment please contact Research Centre staff at vimy.biblio@warmuseum.ca.